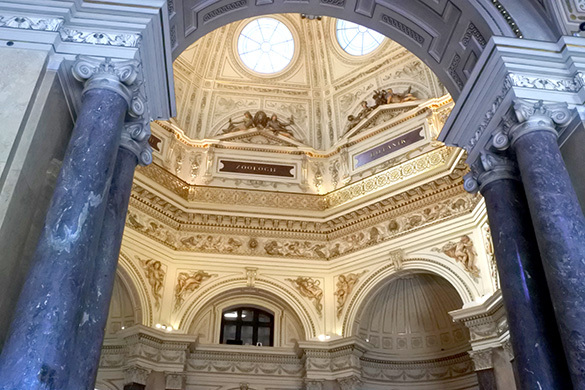 VIENNA, AUSTRIA — As is the tradition of Larwood meetings of the International Bryozoology Association, time is set aside for a guided tour of the most interesting parts of the host city. Given the incredible diversity of Vienna, we had just a taste today of its attractions and monuments in the city center. 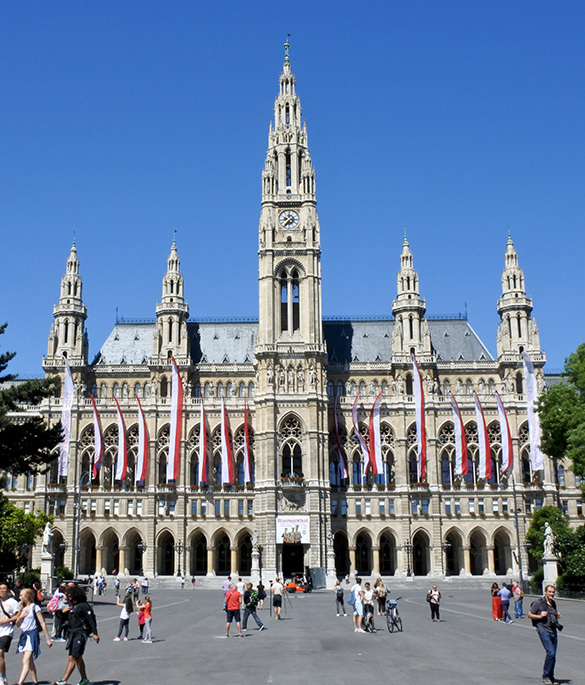 Above is the elaborate city hall (Wiener Rathaus). 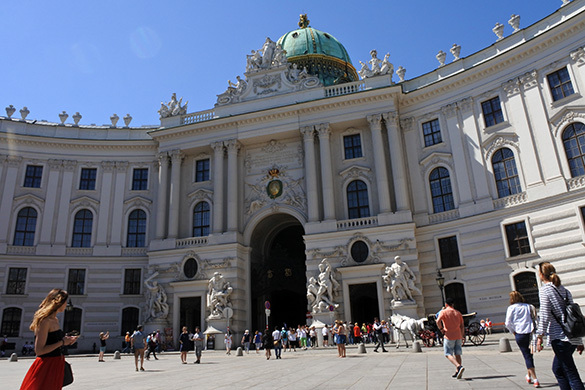 Vienna’s Imperial Palace, the Hofburg, was for centuries the home of the Habsburgs, rulers of Austria and its empire until their epic collapse at the end of World War I. Apparently almost every emperor since 1275 added or otherwise changed the place, making it an astonishing mix of architectural styles (Gothic, Renaissance, Baroque, Rococo, and Classicism to start). Much of it is unfinished since the ambitions of the last emperor were dashed with the fall of the monarchy in 1918. 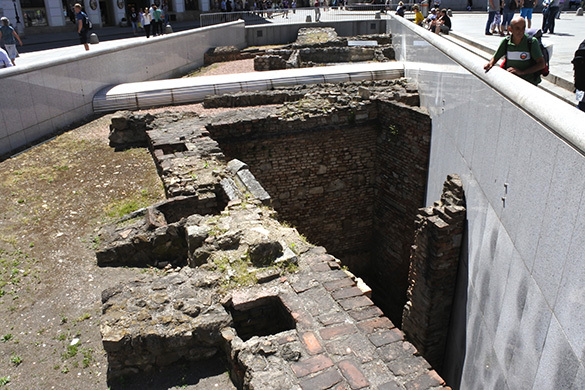 Elaborate Roman ruins about 2000 years old were recently found near the palace. The local rumor is that these are the remains of a brothel! 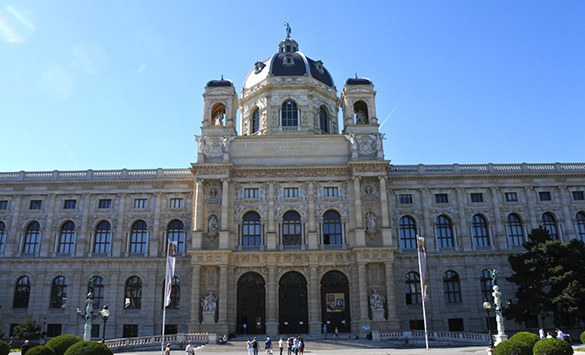 This is the Natural History Museum (Naturhistorisches Museum), Vienna, where we had a limited guided tour. 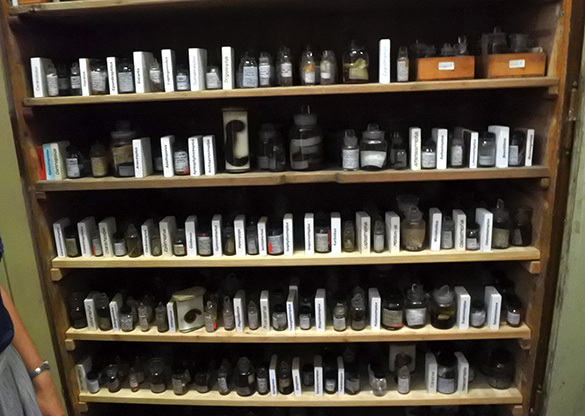 We had an extended tour of the myriapod collections (essentially millipedes and centipedes), concentrating on various aspects of curation and preservation. 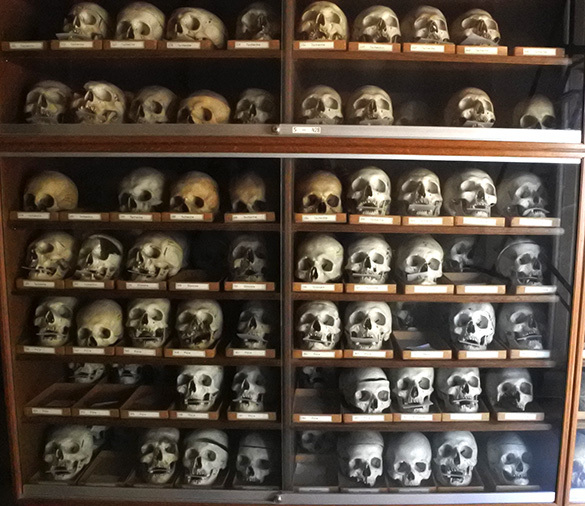 As with most European museums, there is a significant human skull collection. This is a small part of Vienna’s. I never did hear exactly how these skulls were acquired. During my afternoon tea with friends, this was our view to the left towards the center of the museum. This was our view through the window to the right. In the square is the elaborate Maria Theresa monument (the empress surrounded by her generals and statesmen). 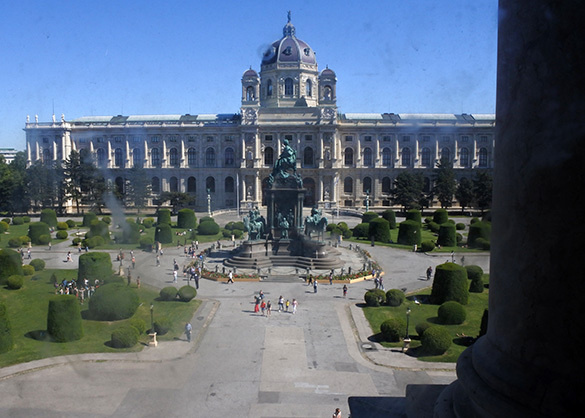 The building on the other side is the Kunsthistorisches Museum, an art and history museum. It was the last place I visited this day. This was the most impressive art object I saw in the Kunsthistorisches Museum: the first-century Gemma Augustea. 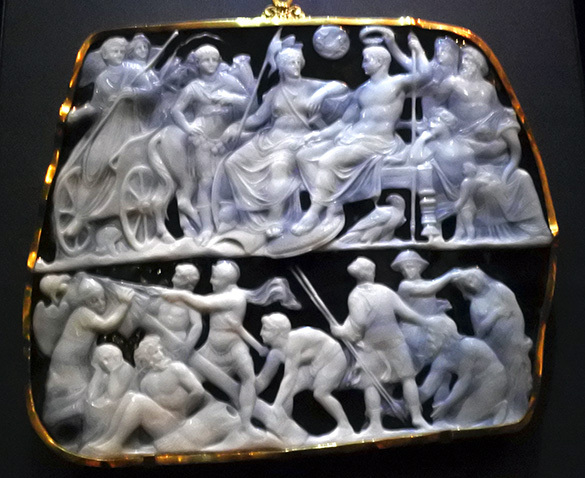 It was cut from a double-layered Arabian onyx stone, making an elaborate cameo. The link tells the long story of this figured stone, along with an interpretation of the grim scene. 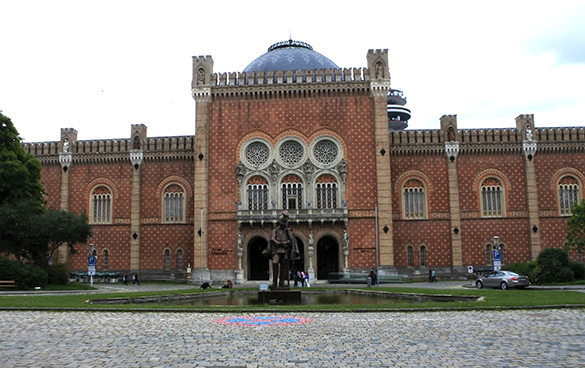 Earlier in my Vienna visit I toured the Heeresgeschichtliche Museum (Museum of Military History). I practically had the place to myself on this weekday. 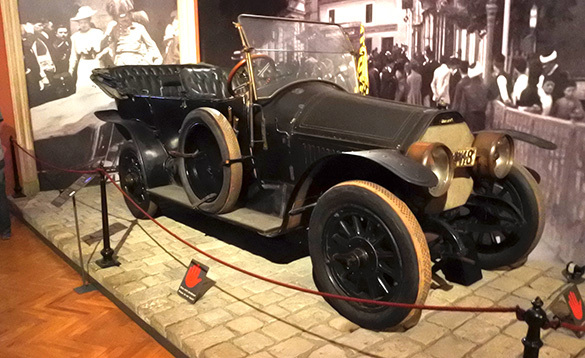 The most evocative object in this museum is the car that carried Franz Ferdinand, heir to the throne of the Austro-Hungarian Empire, and his wife Sophie to their assassinations by the anarchist Gavrilo Princip on June 28, 1914. This was one of the triggering events of World War I. 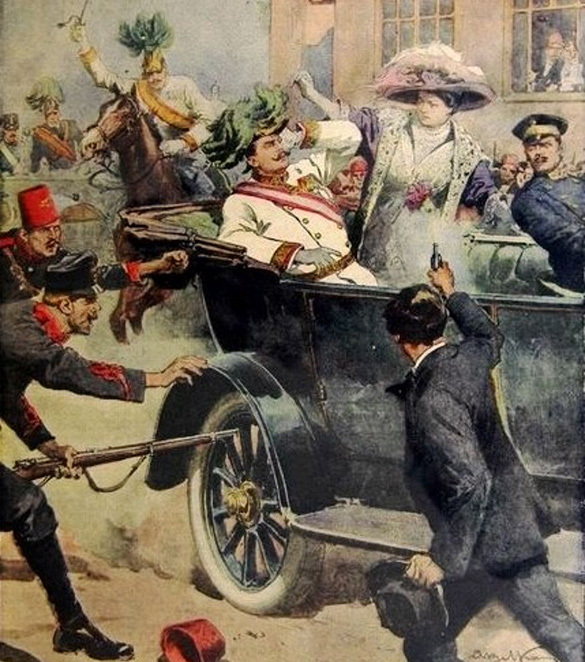 The assassination scene in Sarajevo on June 28, 1914.